In the United States today, African Americans are five times more likely to be incarcerated than whites. Bryan Stevenson, a Harvard University-trained lawyer, works every day to right this wrong. He has argued five cases in front of the U.S. Supreme Court; won reversal, release, or relief for 115 wrongly committed death row inmates; and also won a Supreme Court case affirming it unconstitutional to deliver life-without-parole sentences to children 17 and under. I met Stevenson on an August afternoon in Atlanta, where he was the keynote speaker at Georgia State University’s freshmen orientation. His talk, delivered to a largely African-American audience at an indoor sports arena, was met with a capacity crowd and a standing ovation. 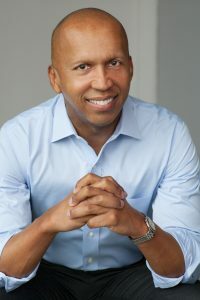 One high point was when he passionately urged students to “get proximate to the problem.” As the founder and director of the Equal Justice Initiative, a Montgomery-based non-profit dedicated to achieving racial and economic justice, Stevenson, 58, has done just this. His extensive laundry list of accolades includes a MacArthur “genius” grant, 29 honorary degrees, and a book, Just Mercy, that became a New York Times bestseller and one of Time magazine’s 10 Best Books of Non-Fiction in 2014. Stevenson and I met in a small, quiet room at the student center, with a table of fruit and bottled water between us. When we finished, he grabbed a bottle for the drive back to Montgomery, where there was much work to pursue. Your work is informed by a powerful sense that history lives in the present. How does the past bear on our current quest for racial justice? You can’t understand many of the most destructive issues or policies in our country without understanding our history of racial inequality. And I actually think it begins with our interaction with native people, because we took land, we killed people, we disrupted a culture. We were brutal. And we justified and rationalized that land grab, that genocide, by characterizing native people as different. It was the first way in which this narrative of racial difference was employed to justify behaviors that would otherwise be unjustifiable. When you are allowed to demonize another community and call them savages, and treat them brutally and cruelly, it changes your psyche. We abused and mistreated the communities and cultures that existed on this land before Europeans arrived, and then that narrative of racial difference was used to develop slavery. In what way? Can you elaborate? I was in East Africa a few months ago. It was the first time I had been there. And it was startling to be in this land and see all of these black people and the beauty of that land. Despite the economic and political situation, there was something so affirming about a space like that. And then I thought about how painful it was that my people, my tribe, my foreparents were in that group of Africans who were kidnapped. Kidnapping is the worst kind of crime in many respects because it lasts for a really long time. Some people have been kidnapped for days and weeks, and that sense of trauma never goes away. And I thought about what it was like for those people to be kidnapped and then displaced, pulled from their land, and then brutalized and tortured and chained. And that’s before they were made to engage in forced labor. Decades of terrorism and lynching and this brutal regime where black people were burned alive and hanged and taunted and disenfranchised and threatened. Most people don’t think about the fact that we had Jim Crow laws. We had racial segregation. Black people wouldn’t have agreed with that. They would not have gone into the decrepit colored bathroom when the white bathroom was better. They wouldn’t drink out of the colored fountain—unless there was the threat of violence. So you cannot disconnect lynching and terror and violence from racial segregation and subordination. And that history continued during the civil rights era, where the response to non-violence was violence. The response to ministers and activists begging for equality was bombs and billy clubs and dogs and fire hoses. And even there, I think we won the legal battle. But, again, we lost the narrative war. The people holding up those signs that said “Segregation Forever,” “Segregation or War,” were not required to act differently, to think differently. And that is the prelude to mass incarceration. That is why I don’t think you can understand the tremendous increase in the incarceration rates, the targeting of black people and menacing of communities of color and poor communities without understanding this history. We have to understand enslavement in a new way. I don’t think we’ve done a good job of educating people about what slavery did. In your book Just Mercy, you cite a 2003 estimate that one out of three black babies will end up incarcerated, and note that this has everything to do with institutionalized racism, which itself is the product of a great deal of hidden racism in daily life. What does that racism look like? Well, there is this burden in America that people of color bear. This presumption of dangerousness weighs on you. And when we don’t talk about it, when we don’t name it, the burden only gets heavier. People of color have to navigate around these presumptions, and it is exhausting. And yet, so hard for so many white people to recognize, much less acknowledge. Yes. You can be very progressive, you can be very educated, and you can still be complicit in the kind of microaggression that takes place when you look at people through this lens of racial difference. So we all have a lot to learn. I don’t think that we should expect to make progress on these issues without bumping into one another, without making mistakes. We just have to have the humility and the patience and the courage to work through that. What I don’t think we should do is just retreat because we don’t know exactly where all the landmines are. You work with a lot of kids. How does this racial bias affect them? I think we have a real epidemic of trauma in America. We have thousands of children that are born into violent families. They live in violent neighborhoods and they go to violent schools. And by the time they are five years old, they have a trauma disorder. There are zip codes in America where a huge percentage of children are going to end up in jails and prisons. And, you know, for our returning vets, we have increased our consciousness about what combat exposure can do and the trauma it can create. But what we don’t really understand is the biology of that. If somebody came into this room and threatened to kill us both, both our brains would start producing cortisol and adrenaline to help us cope with that threat, and then when that threat is eliminated, our prior exposure to trauma is going to dictate how long it takes before our brains get back to normal. And with our veterans, when they’re constantly in stress, the brain gets tricked into turning those chemicals on full time, and so what happens is that those men and women come back from Iraq and Afghanistan, and they’re reacting inappropriately to their family, to their situations. They’re overreacting. The same thing is happening to kids of color, poor kids, because they’ve been in environments where they are constantly being threatened. And instead of treating that trauma, what we do in our educational system in so many places is we aggravate the trauma. We put these kids in schools where the teachers talk to them like correctional officers and the principals talk like wardens. We make these kids go through metal detectors, and we threaten them constantly. It is astonishing to me how many threats are made to kids in elementary schools with poor and minority kids, and those threats are just pushing on all of that stress and trauma. And so when these kids get to be seven or eight and somebody offers them a drug and, for the first time in their lives, they have three hours where they don’t feel threatened and menaced, they want more of that drug. Or when they turn 10 and somebody says, “Hey, man, join my gang and we’ll help you fight all these forces that are out to get us,” you join the gang. Of course outsiders rarely see it this way, right? The rest of us see that child’s addiction and drug use as a sign that the child is bad—not as a sign that we have failed to provide services. And we use gang membership as an enhancement for punishment. It doesn’t mean that gangs aren’t doing destructive and violent things and have to be stopped, but it does mean we need to get beyond the labels that we’ve employed to organize these kids. So that’s an area where I think we haven’t done very well. I think the Centers for Disease Control and Prevention should declare a health crisis in the 200 zip codes where we know the majority of children are going to end up in jails and prisons, where the murder rates are so high. Well-intentioned progressives who want to combat racial injustice talk to each other quite fluently about it, but what we don’t do—and these are your words—is get in proximity. We’re trained to come up with solutions and implement them, but we’re not very good listeners. What do these well-intentioned non-African-American people need to hear? As we’ve [the Equal Justice Initiative] started doing community work, what we’ve learned is that, if we’re not attentive to the power dynamics—who feels privileged and who doesn’t—people will act in ways that they genuinely do not see as problematic but that are incredibly problematic. You can’t do reconciliation work, you can’t do restoration work, you can’t do racial justice work, you can’t create the outcome that you desire to see until there has been truth-telling. And truth-telling has to happen when people who have been victimized and marginalized and excluded and oppressed are given a platform to speak, and everybody else has to listen. In South Africa, the model was a forum, and it was one survivor after the other giving voice to their experience. In Rwanda, the people who had been targeted and victimized had the opportunity to give voice to that, what it felt like, the pain it created to see people lose their whole families. I think this understanding of truth and reconciliation would mean that some of us would have to reorganize whatever plan we had in mind to create racial justice. Because if we haven’t been in that listening space, if we haven’t created an opportunity for people who are the victims of this bigotry to give their true story, to tell their truths, then our solutions are not going to be very informed. For Dr. King, and those who were part of the non-violent tradition in civil rights work, it would have been so much easier to try to work people up, take advantage of their anger, arm them, and go fight a battle. But it would not have been successful. It would not have created the reforms that we seek. Non-violence actually requires something much more evolved, and I think, in many ways, it takes a sort of absence of privilege sometimes to see the way forward. And so if you are privileged by education or privileged by wealth or privileged by color or privileged by status, you really need to listen before you can formulate a strategy that is going to have an impact on these really vexing issues. Do you see the potential for this kind of mature approach to activism? I see it all the time. I see it with the young people, who I just want to keep encouraging, because there’s a little bit of a movement in our country now, and I see it on some of the campuses, where people feel very empowered to give voice to progressive ideas, and they feel very comfortable challenging other people and holding other people accountable. But I think it’s necessary that it be disconnected from a sense of privilege because too often people who are willing to participate in a sit-in or to engage in counter-protests or to participate in a demonstration are not willing to actually serve the poor. They’re not willing to pursue a career that creates proximity to the systems that we’re so provoked by. And I want to make sure that we understand that what you do for a couple of hours is not going to negate what you do for a lifetime, if what you do for a lifetime is adding to the problem. Back to the idea of truth-telling. EJI is working to highlight the reality of the South’s racial legacy by building an African-American history museum and a monument dedicated to lynching victims, both due to be completed this year. You have also managed to have several historical markers placed next to warehouses that were once slave markets. Can you discuss this mission a bit? Well, we wanted to create a consciousness about slavery, because part of the reason we are comfortable with the iconography of the Confederacy is because we really haven’t told the truth about the barbarity of slavery. That Michelle Obama can, at the Democratic National Convention, invoke the fact that she is living in a house built by slaves, and that that would elicit the reaction that it did, and people start defending slavery, just tells me that we have a lot of work to do in this country to create a consciousness about what that institution really is. In the South, in particular, this narrative that, “Oh, slavery wasn’t that bad and people were happy”—that kind of stuff is still out there. And if that’s what you believe, then it’s hard to be provoked by the identity of the Confederacy. And that’s why we’re building this museum. When you walk into our museum, you’re going to see a sign that says, “Montgomery, a city shaped by slavery.” And we’re going talk about the pain and the suffering that the domestic slave trade created in this country where half of enslaved people were separated from their families, their children, their spouses. We found these amazing slave narratives, and we want people to hear first-person accounts about the heartbreak, about the loss, about the anguish of fearing that your child was going to be taken away from you at the auction block. And I think if we can learn those stories, if we can understand that history, then we’re going to have to think differently about those who would defend it, those who would fight to preserve it. The same is true for lynching. You know, lynching was terrorism. We now have a consciousness that terrorists are really bad people. They are worse than criminals. They are people who you may have to go fight a war to eliminate. We’ll put them in prisons. We’re not even worrying about whether they get a trial or not. A terrorist, we believe, is a species of person for whom there should be no sympathy. And our consciousness about that has evolved as a result of being targeted by terrorists. And I think it’s important that we understand the way in which we accommodated terrorism in this country in so many communities where African Americans were victimized and brutalized. And if we understand our own terrorist past, our own terrorist history, it may sober us in dealing with these contemporary issues, but it also may shame us into thinking that, you know, we really haven’t said enough or done enough to recover from that. It seems like there’s a really interesting dialogue taking place right now over the removal of statues and plaques, and I’m wondering where you stand on all that and how your project fits into it. I think you have a progressive mayor in New Orleans, a city that has enough of a progressive base that you can politically pull that off. And Charlottesville is a much more progressive community than the rest of the state of Virginia. And I think we should act in those spaces. But, ultimately, I think we have to work on creating a new consciousness about this history in Mississippi and Alabama and rural Georgia. I want people to take down Confederate monuments, symbols, and iconography because they’ve been persuaded that it’s not right. And it can be done, right? In post-war Germany, people didn’t overnight say, “I hate the Nazis.” That was a long process. But they couldn’t hide from what the Nazis did. There was this effort at exposure. People had to adjust. And I think that we haven’t really done that in America. And because we haven’t done that, we are burdened with this iconography. We’ve got 59 markers and monuments to the Confederacy in Montgomery. We’ve got the first White House of the Confederacy. Our two largest high schools are Robert E. Lee High and Jefferson Davis High. Half of these kids today went to schools named after Confederate generals. And it’s that disconnect that we’ve got to expose. We’ve seen optimistic pieces of legislation—from the Emancipation Proclamation to the Thirteenth, Fourteenth, Fifteenth Amendments, to Brown v. Board of Education, to the Voting Rights Act, etc. Nonetheless, if you’re black, you’re still about three times more likely to get shot and killed by law enforcement. How is policy working, and how is it somehow falling short? I think we have to recognize that policy can be powerful in changing things, creating opportunities. But I think what’s equally important is the narrative battle. That is how we understand what that policy is about, who is it for, and why does it make sense. The policies on domestic violence have shifted dramatically in the last 50 years. Fifty years ago, we did not view domestic violence as a serious crime. If a woman called the police and complained that her husband had beat her or abused her physically, the police officers would show up, they’d call the husband outside, they’d tell some jokes, they’d smoke. Their job was to make sure the guy was calm, and then go about their business. And to change the policy we had to change the narrative. Remember The Jackie Gleason Show, where the punchline was, “To the moon, Alice, to the moon.” He was threatening to hit her and knock her to the moon, and everybody laughed. And then Farrah Fawcett stars in this movie called The Burning Bed where she plays this domestic-abuse victim. And she was, at the time, this very attractive, well-admired actress. But she puts herself in that role, and you begin to see stories about what it’s like for women to be abused. And all of a sudden the narrative starts to shift. We’re no longer blaming women for making bad relational choices. We’re saying that violence and abuse is always wrong, and it doesn’t matter whether it’s some stranger crawling through the window or it’s the man you married. And that narrative shift then began to shift the policy. We have marriage equality. I think it will prevail. I think it will be embraced in Alabama. We’ve been working on showing people that someone’s sexual orientation doesn’t define them, that it doesn’t make them bad, it doesn’t make them predatory, it doesn’t make them dangerous. And so the policy work is critically important, but it has to be married with narrative work that does work on the hearts and minds. It’s just not enough to pass the law. What I’m wondering, given all the heavy stuff we’ve discussed today, is how you stay hopeful. The judicial victories are significant, but still, it takes time to change those hearts and minds. Well, I really do believe in things I haven’t seen. I actually believe that we can create communities in this country where people are less burdened by our history of racial inequality. I believe it, even though I haven’t seen it, and I just think that hope has real power in how you live and how you function. I don’t think we’re allowed, frankly, to get hopeless and beat down, and I think that’s the upside to understanding this history. The more we understand the depth of that suffering, the more we understand the power of people to cope and overcome and survive—because my grandmother was the daughter of people who were enslaved, and her father was in her ear every day of her life talking about slavery, and she was in my ear, I feel the force of their strength. I really do. And, you know, I grew up poor, but because of the way my grandmother raised my mother, my mom took loans and went into debt to buy a set of encyclopedias in our house. And there were times we didn’t have a lot of other things, but we had The World Book Encyclopedia. And that idea that knowledge and information could empower you was something that kind of strengthened me. And so I say all of that because I do think there is this community of people who think like this, and I feel like I’m being watched by my foreparents, who were enslaved. I feel like I’m being watched by my foreparents, who were terrorized. I feel like I’m being watched by those who had to deal with the indignation of segregation. And because they’re watching, I can’t afford to stop. I can’t act as if I can’t do this, that we can’t create something better and bigger. And, you know, when you’re surrounded by a community of witnesses like that, it will inspire you to do things you might not otherwise be able to do.